Prenociste Stojic i Novi Sad, Serbien: Reservér nu! 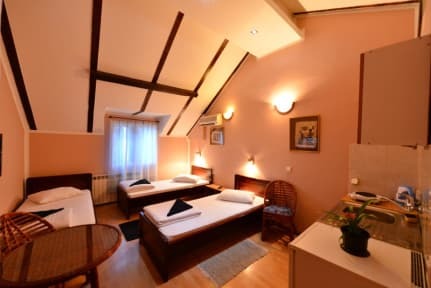 Villager Stojic Novi Sad is located in a beautiful new building with a nice green garden with terrace. In our basement Guests can relax in our room for a pool. We offer a high standard of service for long and short stay guests include laundry service and 24/7 reception. Computer, fax and photocopying services are also provided upon request. 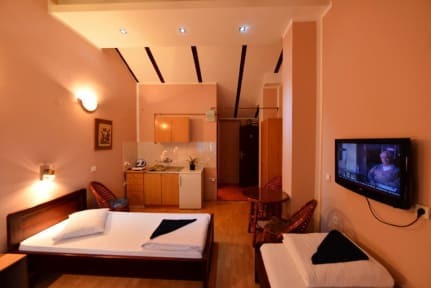 All apartments are air-conditioned, equipped with central heating, security alarm system, cable TV, free wireless broadband internet and fully integrated kitchen. Bedrooms with double beds, bathroom with shower and toilet. For those arriving by car, we provide a free car security. The building is fully secured with e-cards and cameras are installed.